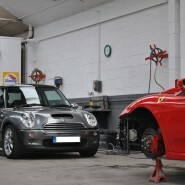 As we speak we are finishing work on this lovely Mini Cooper S and the Ferrari F430 you see here. Whilst as a bodyshop we take on many premium high end sports and GT cars, we also work on more every day cars such as Mini’s, Fiats, BMW’s and Fords. If your car is your pride and joy and you want the best work possible for it, E and A coachworks is a long established top quality London paint, body and repair shop based in Wembley, London. If you are at all unsure, but know you definately want anything from a touch-up to a full restoration, give us a try!